Advice : Go to wifi hacking and follow the posts in sequence. 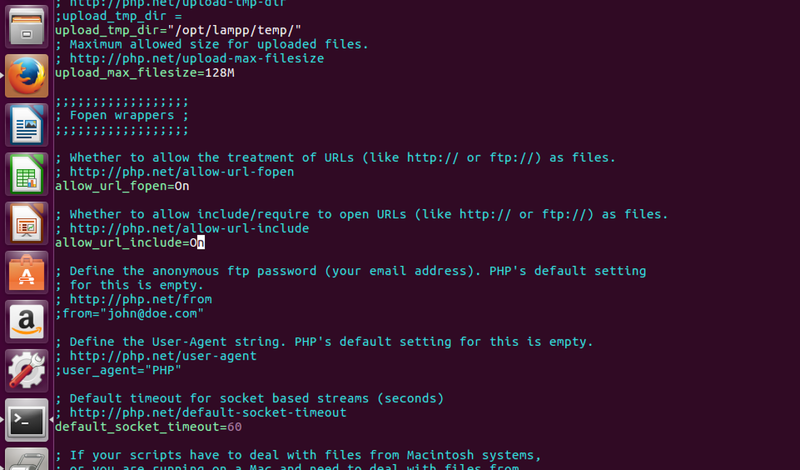 Wifi hacking is the easiest to get started. 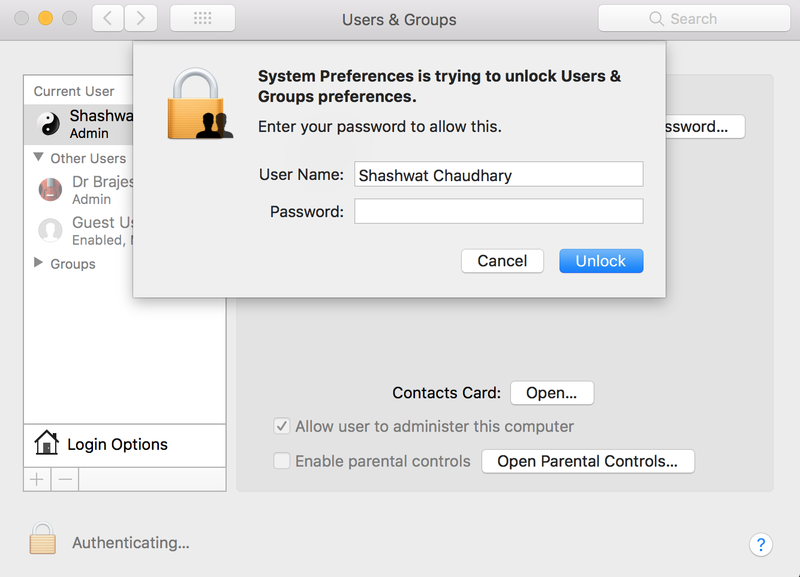 If you've been following security news, you'd know that Mac OS High Sierra has a security bug. Most of the articles have done a fine job explaining all the fluff, so I'll get straight to the point. 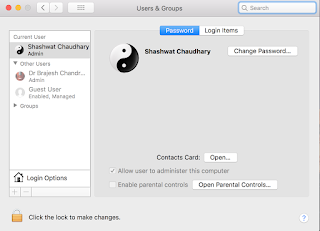 If you have no password for the root account (as is the case for most users, since they haven't explicitly set up a root account and password on their system), then Mac will accept a blank password for logging into root. 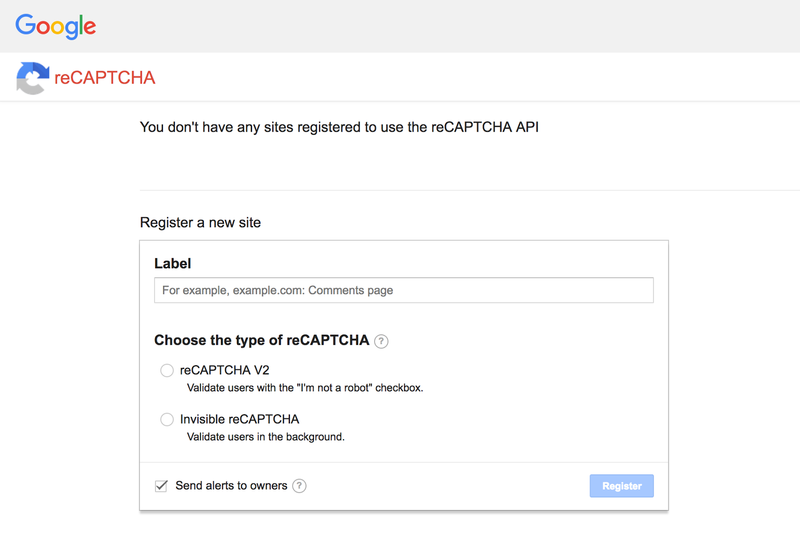 Step 1 : Go to a place requiring admin privilege authentication. 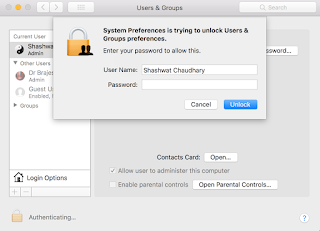 For example, Users and Groups in System Preferences. Step 2 : Click on the lock, and you'd be prompted to login. Step 3 : Change username to root, leave the password field blank (After changing username to root, press tab to move to the password field, then tab again to go back to username field, and then click unlock, otherwise this won't work). That's it. You can get creative regarding what all you can accomplish with this. I haven't tried it, but I've heard that this attack (bug :p) works remotely! Seeing as how this bug puts your system at risk, I'm sure you are curious as to how to fix it. 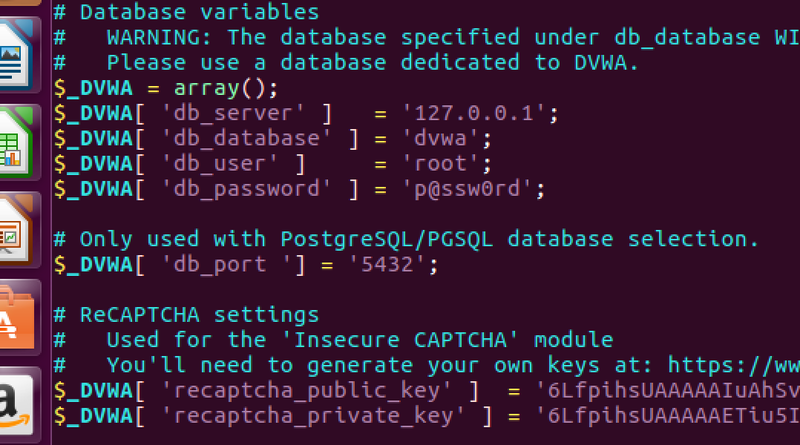 One way is to give your root account a password. Let's first check if the update is installed. So, if you have and old version like me, let's head to the app store and install the update. Sure enough, here's the update we need. It'll take a bit to get installed. Once that's done, let's just run the same command again and verify that the version number increased to our liking. Now we're all good. Bug seems fixed. That's it for the post. The first category comprises the typical viruses that infect your computers, get inside your USB, copy themselves to every avenue they can. They slow down your computer, limit it's functionality, and in general, make a lot of changes that make them easy to detect. These, in general, serve no particular useful purpose for the writer of the malicious code, other than perhaps giving them the lulz or maybe some sense of accomplishment. Also, once spread, there is very limited amount (or none at all) amount of control that the writer of the malicious code has on it's actions. Most viruses would copy themselves to all devices attached to the infected system, try to spread via the network, internet etc. from the infected system. Trojans will not automatically copy themselves. They will stay hidden and inactive. As with everything else, the means of spread of trojan is also precise. The malicious code writer will hide them behind a legitimate file, and then spread this file using social networks, spam mails, etc. This way, only those computers will get infected that the attacker wants to infect. 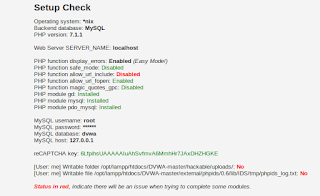 Remote Administration Tools (RATs) - These are trojans which, when installed on the system, silently position themselves in such a way that they allow the attacker to control the system remotely. This means that the attacker can browser all your files, read all your data, see what you're typing (hence get all your accounts and passwords), get a live feed of your screen, and access your webcam. As you can clearly see, as opposed to other viruses, trojans have specific use for the malicious author. He now controls the infected computer. Botnet - This is a special use of a freely spreading trojan whose purpose is to infect as many computers as possible with a RAT like functionality but less control on who gets infected. This reduced control and increase rate of spreading is important because of the purpose of a botnet. Botnet is basically a large network of infected computers which the attacker uses to do his bidding. They are often used to carry out DDOS attacks. Suppose the trojan spread to 1000 computers (a very small number, there are HUGE botnets out there). The attacker can then use these 1000 computers to simultaneously attack websites and take them down. Another use for botnets is bitcoin mining. If you have been paying attention so far, you'll notice that once infected by a trojan, a computer's files are under control of the attacker. That means he can easily say- "Give me money or I'll delete all your files". Unfortunately for the attacker, once the victim sees this message, the trojan is no longer covert. The victim may install an antivirus, backup his important data to the cloud/ external storage media/ USB, etc. What the attacker can do is similar to what happens when you find a compressed archive with a password. If you know the password, you can uncompress the archive, otherwise not. So, the attacker will take all files except the System files (without which your computer won't work), put them into a compressed archive with a secure password, and then delete the uncompressed files. Once he's done with compressing (encrypting really) everything, he'll inform you about what just happened, and tell you to pay him a certain amount in bitcoins in exchange for the password of the compressed archive (i.e. the decryption key). If you don't pay up, he will delete the compressed archive and your data will be lost forever. 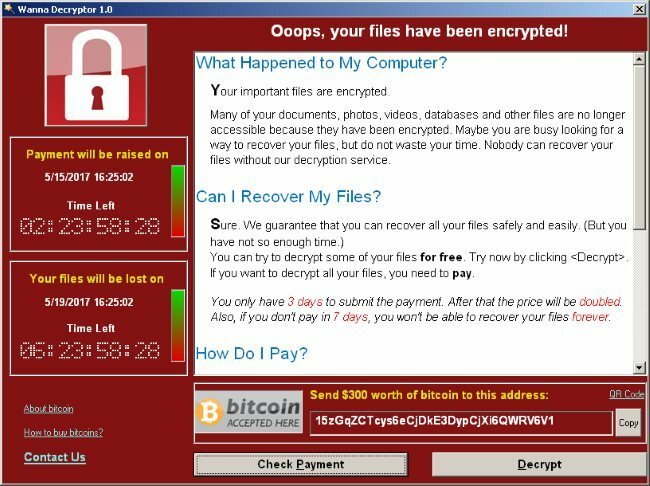 Even if you manage to remove the ransomware after it announces it's presence, it's a bit too late. You avert the possibility of data deletion but that doesn't mean that you can now get your data back. You still don't know the decryption key, and unless there's a cryptographic flaw/weakness in the encryption scheme used by the attacker (basically weak password is used), it's almost impossible to find the key and decrypt the data. 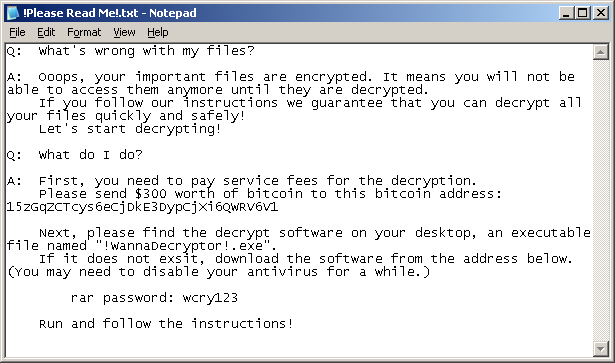 So while there have been ransomware around for quite some time, this one has spread to epic proportions. Why? The credit for this goes to NSA for discovering the EternalBlue exploit and Shadow Brokers for releasing it to the public. I won't delve into further details of this, but EternalBlue exploit can hack any Windows machine which didn't have the patch for it. What does that mean? The standard Windows security update on 14 March 2017 resolved the issue via security update MS17-010, for all currently supported Windows versions. "The issue" referring to the vulnerability. However, many systems have automatic updates disabled and didn't have the patch. All these machines were vulnerable to this attack. Considering how often people end up disabling automatic updates (because they're annoying), you can imagine the scale of the EternalBlue exploit. 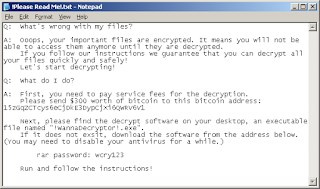 This is the reason why this particular ransomware was able to spread so quickly. If you don't pay in a week, all files will be deleted permanently. This is it for this article. All the stuff in red needs fixing. If you are lucky, we have the same set of issues which need fixing. Otherwise, you'll have to do some googling to find out how to fix problems which you are facing and I am not. 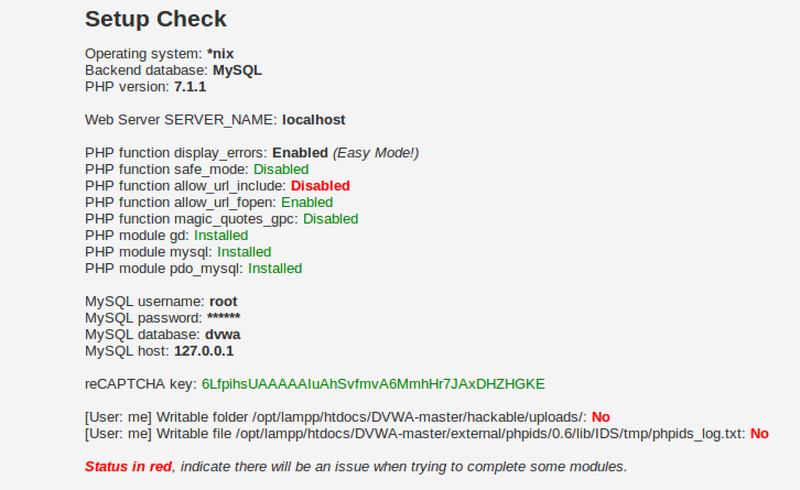 The default credentials are 'root' and 'p@ssw0rd' in the config.inc.php file. 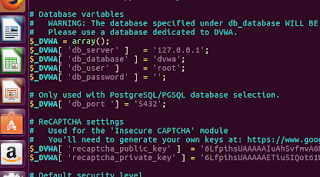 We change it to the correct mysql login credentials, 'root' and '', in my case. 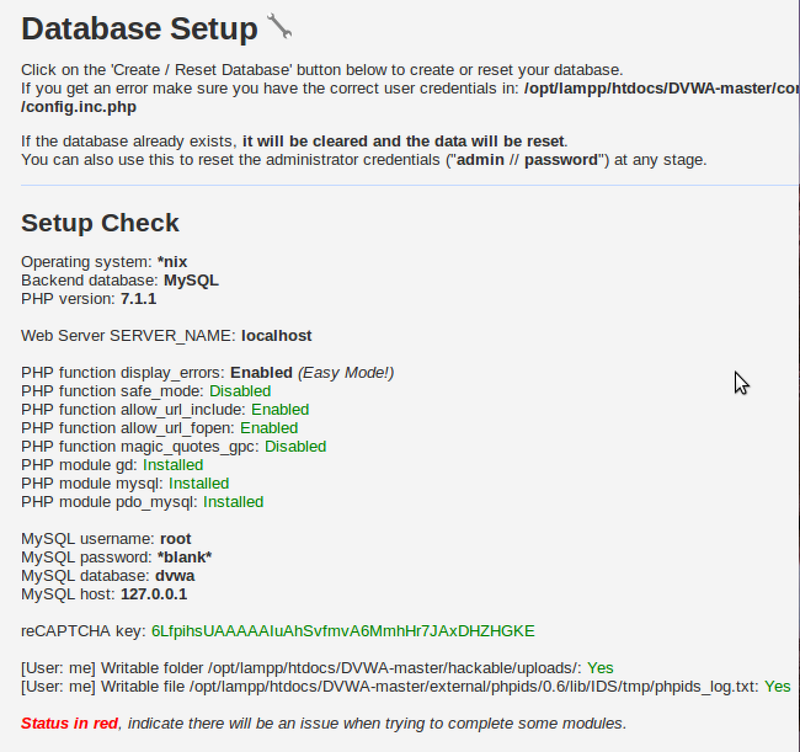 You can change depending on your mysql credentials. 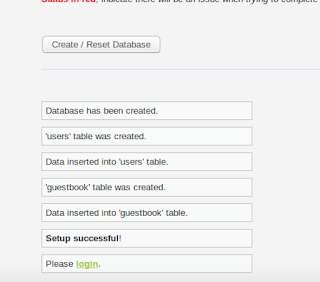 This gets rid of our biggest worry - Unable to connect to database! 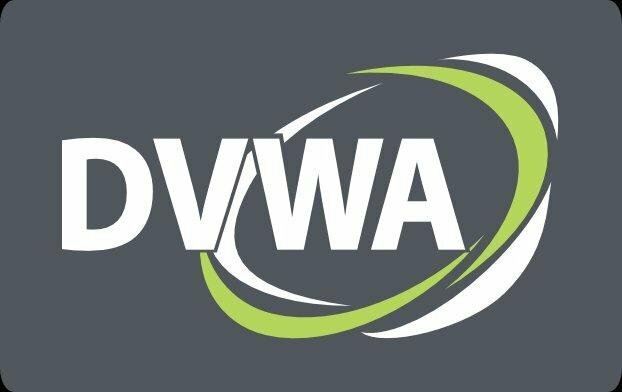 perfectly, but DVWA will run. Without fixing this, we won't even be able to start. 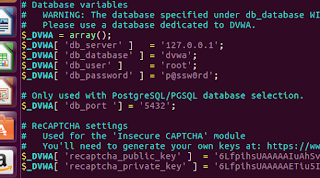 To fix this, open /opt/lamp/htdocs/DVWA-master/config/config.inc.php file in your favorite text editor. 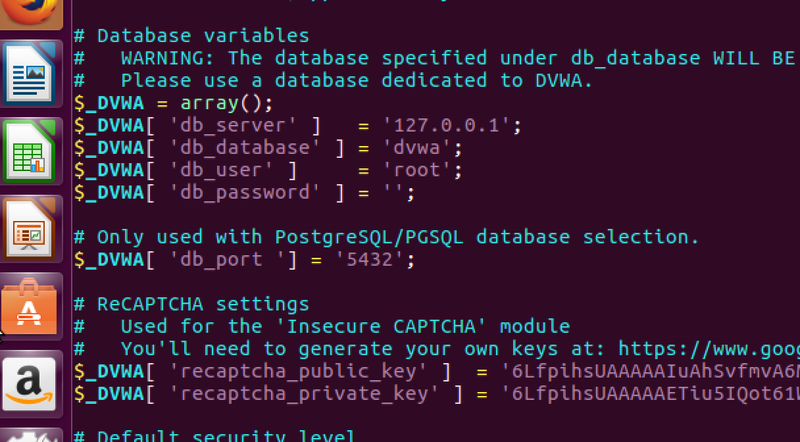 This password isn't the password of our mysql database. In my case, password is nothing, i.e. two single quotes (i.e. ''). the username too is need be. This is the corrected password value in my case. 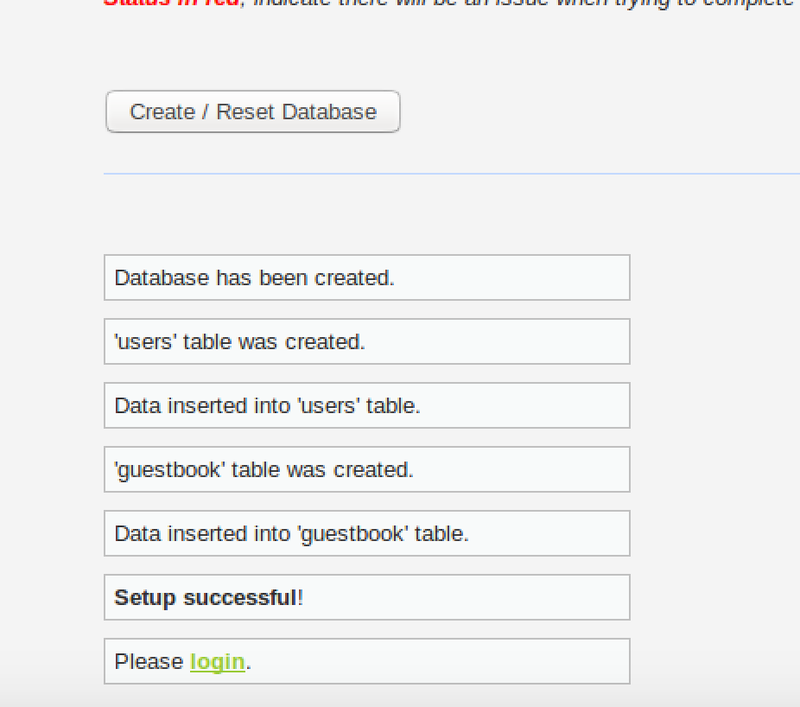 After this, refresh the page and click "Create/Reset database"
Now everything works fine after you click Create/Reset database. Now we'll fix the other remaining issues. 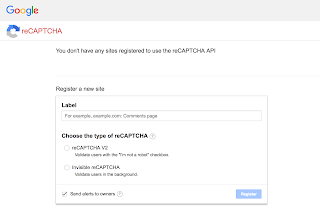 Edit the recaptcha public key and private key fields. Here is what I did. 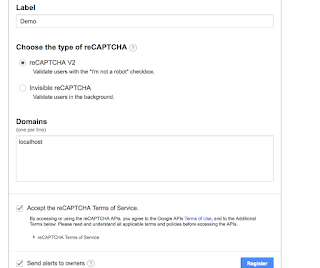 Now we have a a recaptcha key. One red down, 3 to go. We simply have to locate the configuration file and edit the value of the parameter from Off to On. 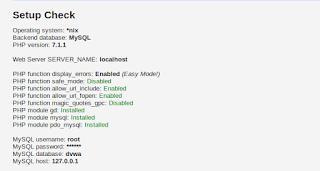 Note: Any other function which is disabled can be enabled in a similar manner. 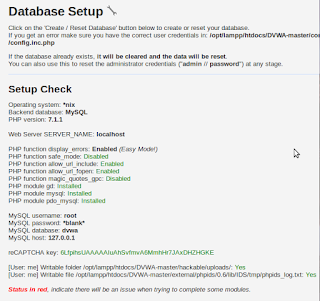 All settings are in the php.ini file. You just need to search for the corresponding line and edit it. If a module is shown as missing , then we need to install it. In my case, everything is installed. Most likely, since you are also using XAMPP, everything would be installed. However, if that is not the case, then you have to figure out how to install the modules. 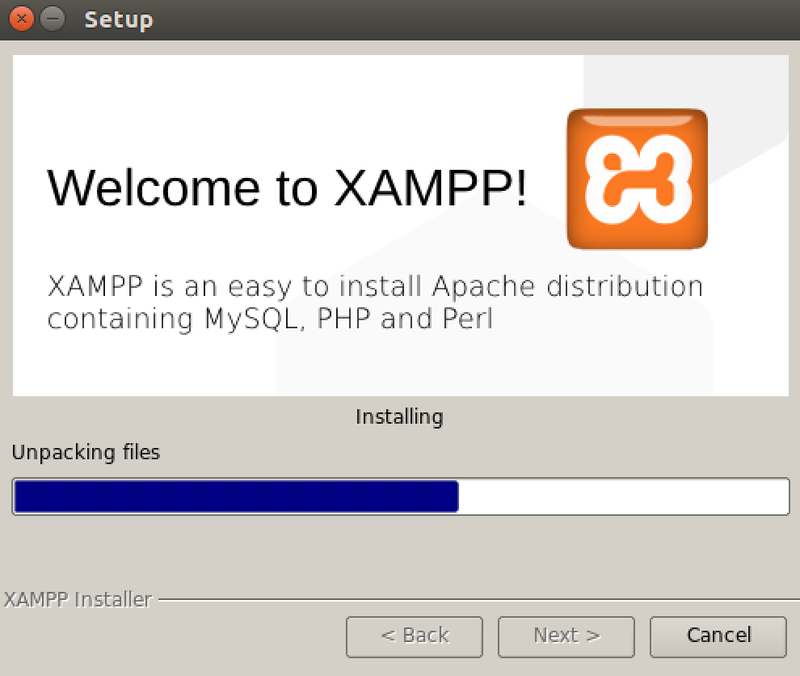 If you aren't using XAMPP and did everything manually, then apt-get would be the way to go. 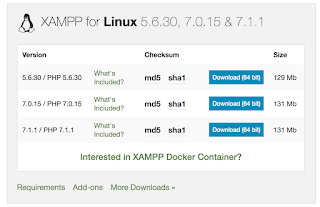 Otherwise look at XAMPP's (or whichever bundle you are using) documentation. Replace directory with the correct directory. Everything is green finally! Also, notice the credentials, we'll need it later. 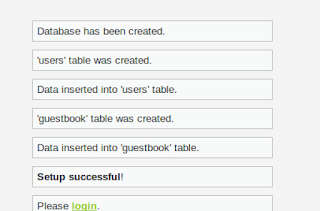 Database created. 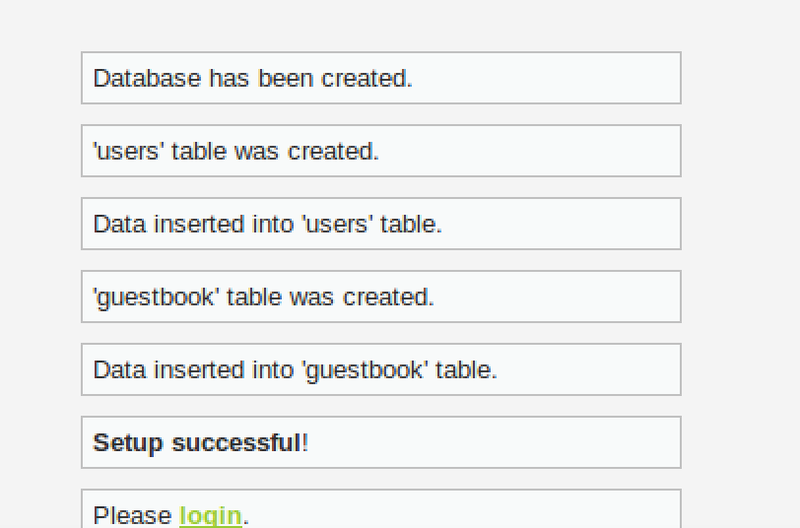 Populated with tables. 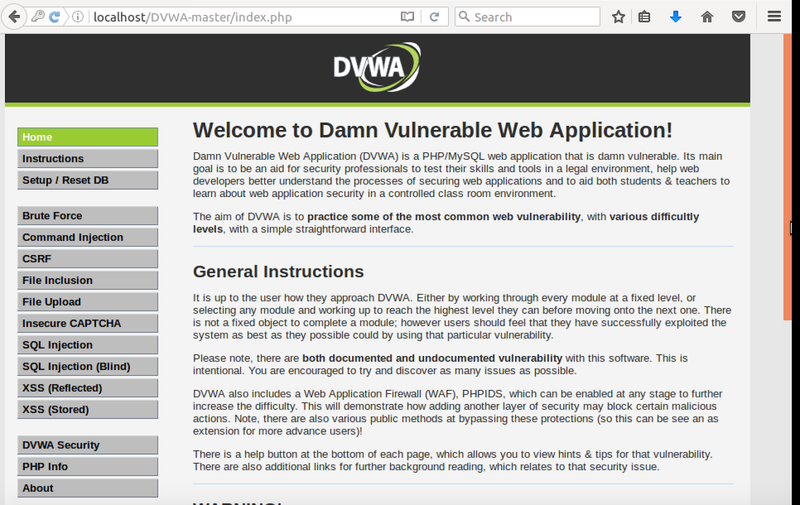 Finally the damn vulnerable application is running. The username = "admin" and password is "password" ("admin // password" that we saw three pics ago). Everything is running perfectly. This is the page you should see after successful login. I'll leave you at the welcome page of DVWA. In the next tutorial, we'll begin proper exploitation of the intentional vulnerabilities, moving from trivial stuff to the really hard stuff. The first two tutorials complete the installation and configuration parts. Without any preface, let me get straight to the point. 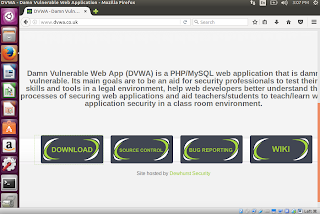 In this tutorial, we will be installing Damn Vulnerable Web Application (DVWA) on a Ubuntu virtual machine. Our attacker machine would be Kali Linux, which is also installed as a virtual machine (or virtual box). The host can be any OS, and doesn't matter since we won't be using it at all. An alternate configuration is when your host is either Kali or Ubuntu, in which case you need only one VM, to install their the other OS. Alternatively, you could just use a single Kali machine both as attacker as well as victim (running the vulnerable application). However, that makes things less realistic. Disclaimer : No cool stuff in this tutorial, just straightforward installation. You need to have Kali Linux (rolling release) and Ubuntu (I'm using 16.04) up and running. If you aren't familiar with virtual machines and stuff, then take a break of a few days, get familiar with them, install and run a few Linux (any flavour) VMs, drink some coffee, etc. 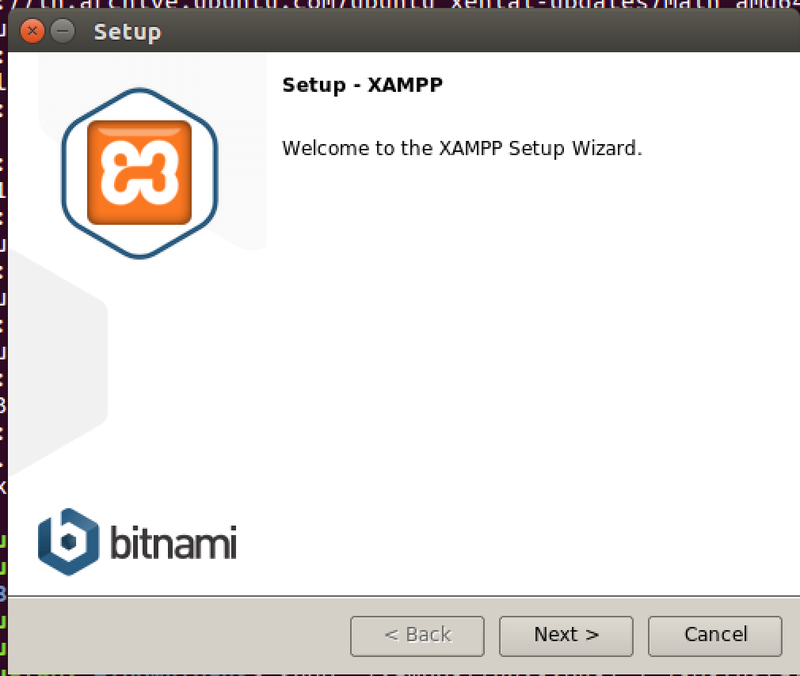 Once you're comfortable with virtual machines (and have Kali & Ubuntu up nd running), proceed onward. You also need some minimal knowledge of linux, networking, and web applications. As an exercise, you could try getting some free web host (a pathetic one will suffice, since you are only doing this for learning and won't need anyone to use your website), and deploy a wordpress site. 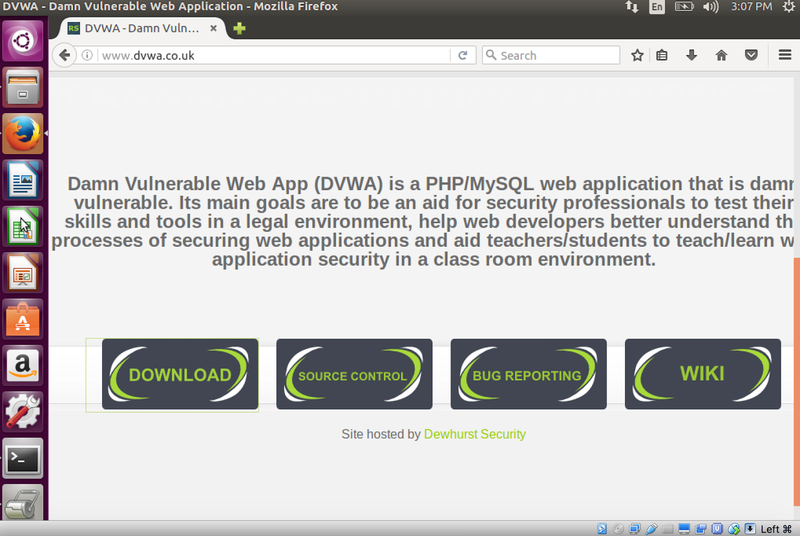 Tinker around the website, install themes and stuff to get a feel for it. 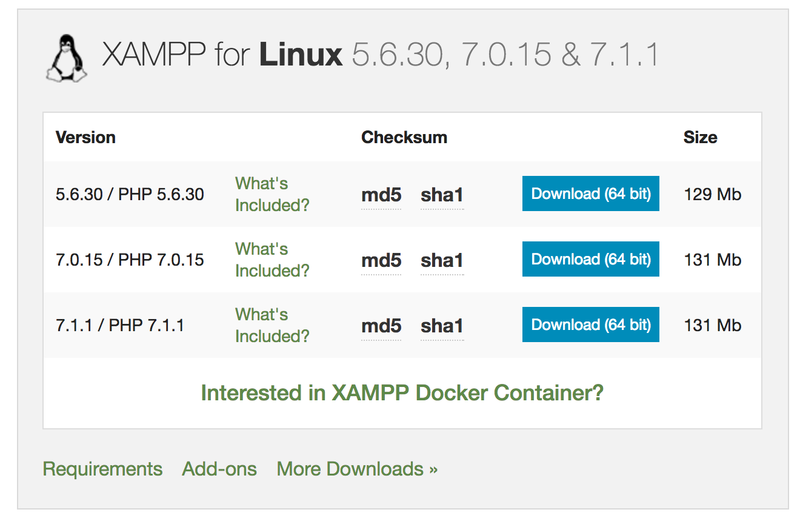 Then, go one step further and deploy a wordpress instance on your linux virtual machine. 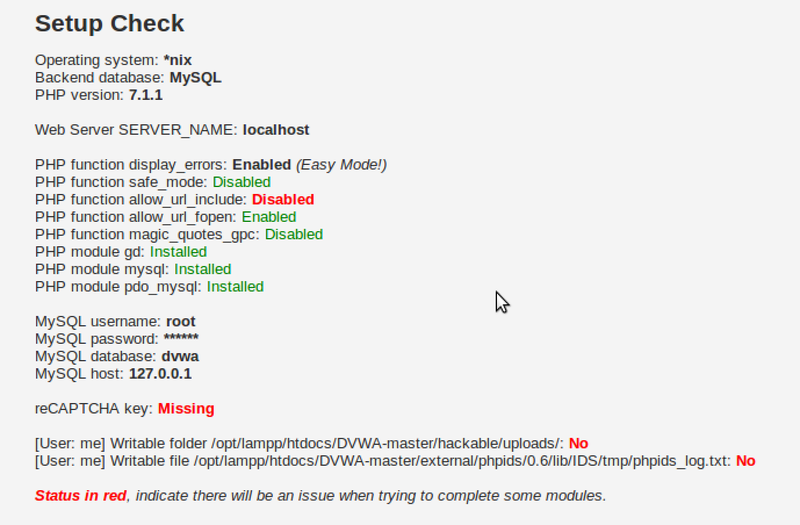 This time, don't use the wordpress UI to do things, but instead try and figure out stuff manually. Install themes, modules, etc. on your own by placing them in the correct directory. Just tinker away, in short, till you have some level of familiarity with web applications. 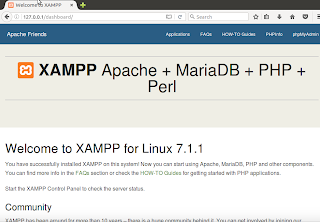 Now, you are familiar with web apps, virtual machines, and linux (not networking though). The task above were pretty simple but for now you can move ahead with the tutorial with the given amount of expertise. 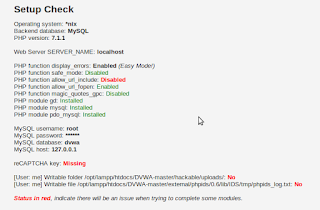 Also, the pre-reqs listed above are for the entire web pentesting series, and most probably you'll be able to follow this tutorial without completing some of them, since this is the first and very basic installation tutorial. Important: Make sure you use the same version of stuff as me. 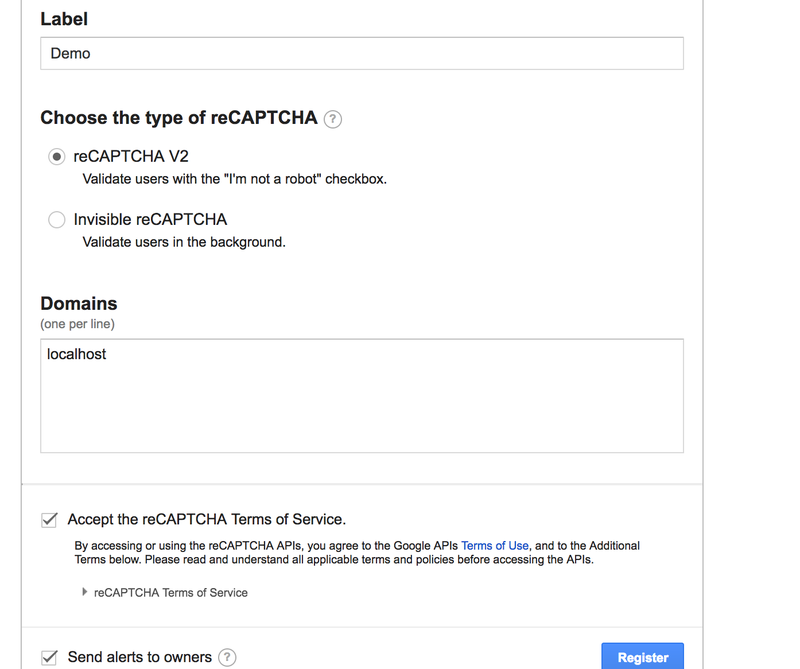 This will avoid scenarios where our systems behave differently (in which case you'll have to use google-fu to figure our how to deal with unexpected stuff happening). This is a fairly simple procedure. Below are screenshots with explanation. At the end of the tutorial, I have listed commands that you need to type to get all this done (you can simply copy paste the commands). The unnecessary steps are not present in list of commands (in screenshots they are there to enhance your understanding oh what's going on). 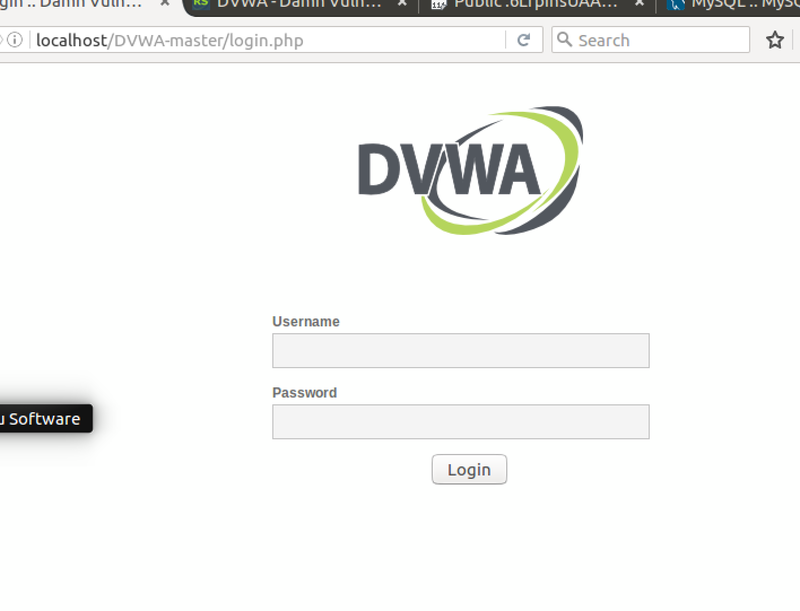 First we will download DVWA. Then we read it's doc and find out what to do. 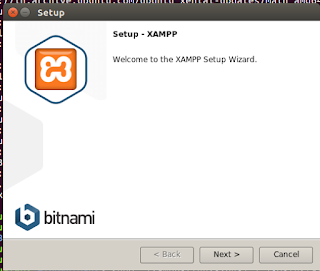 After reading doc, we realize we need to install XAMPP, we do that. 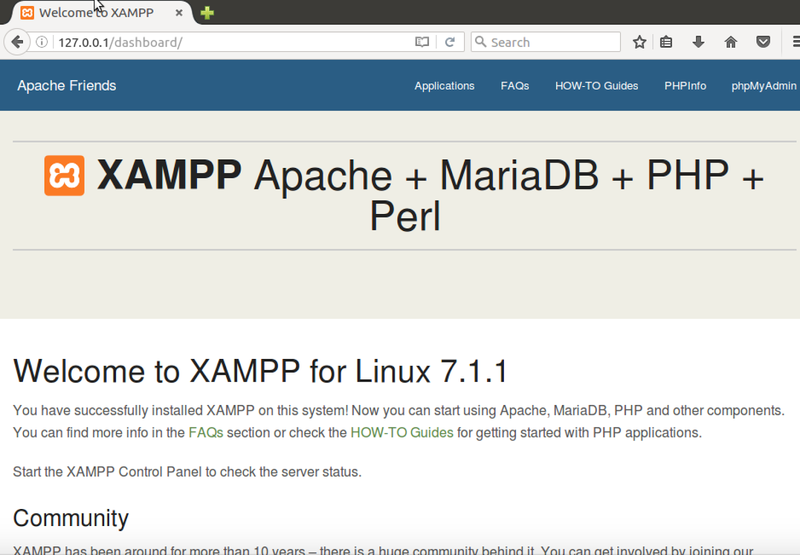 After installing XAMPP, we test if it works by starting it and opening localhost on our machine. 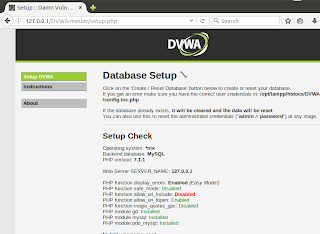 Once we're sure that XAMPP works, we will proceed and copy DVWA files to htdocs folder of XAMPP. 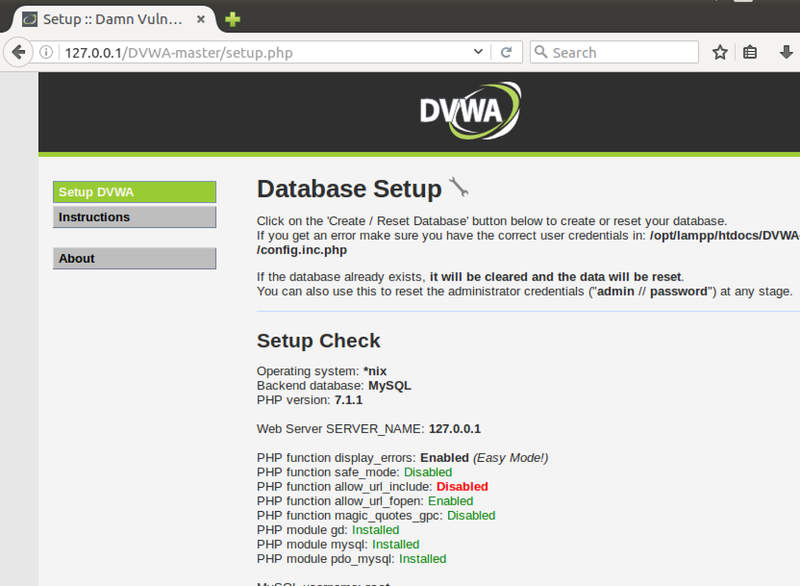 Now we check if localhost/DVWA-master leads us to the vulnerable app. If it does, then we did everything right. Open Damn Vulnerable Web App website in your browser. Click on download. You'll get an archive, extract it. Navigate to the extracted archive. Get a lay of the land. 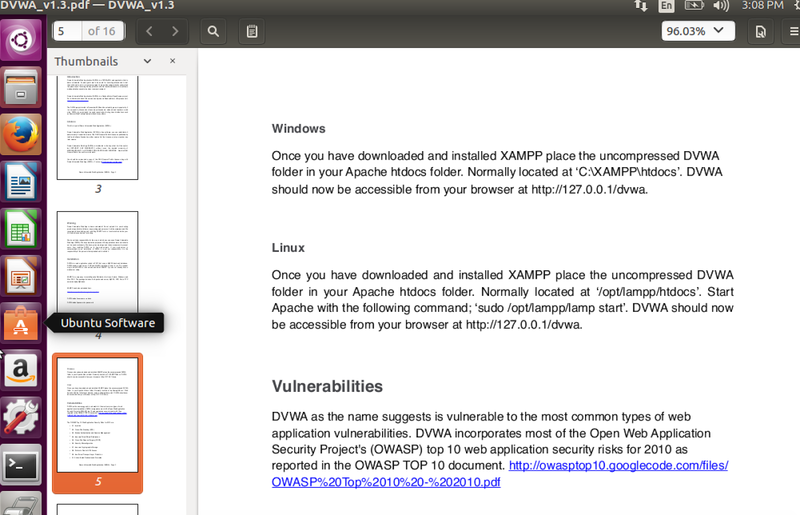 You'll find that there is documentation available in docs folder. with any other equivalent software bundle, but for ease, let's stick to the recommended way. It's a simple installer. You'd know what to do. and running properly. 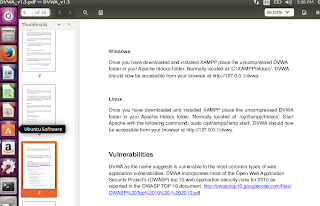 Let's run our vulnerable app on XAMPP now. As suggested by the documentation, we simply move our folder into the htdocs directory. There is still further configuration to be done, but I don't want to extend the tutorial any further. After the next section, there is link to part 2 of this series. 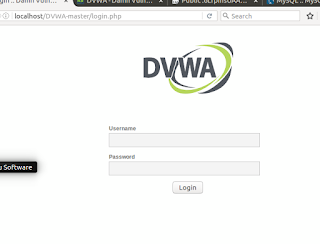 DWVA-master directory is located in home folder (the archive to be downloaded and extracted to obtain this directory). Supported auth-types: "user/pass" for SOCKS4/5, "basic" for HTTP. That's it! 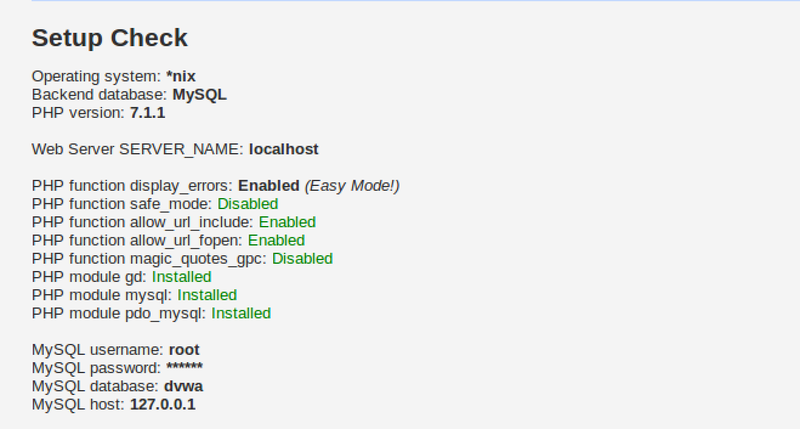 Now you can use proxychains with any sort of command.